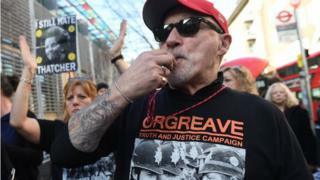 A "noisy protest" has been held outside the Home Office in London by campaigners calling for an inquiry into the 1984 Battle of Orgreave. Hundreds of trade unionists, supporters and former miners joined the Westminster demonstration earlier. In October, Home Secretary Amber Rudd turned down calls for an inquiry into the policing of the bitter year-long miners' strike. Joe Rollin, Unite union official and chair of Orgreave Truth and Justice Campaign, said: "We want to send a clear message... that we aren't going away and that our fight for the truth will go on." Chris Skidmore, Yorkshire area chairman of the National Union of Mineworkers, who was at Orgreave, said: "We want to heighten awareness of what happened and the justice of our case for an inquiry." Eighteen newly-declassified files released to the National Archive last week showed Margaret Thatcher's government feared a "witch hunt" would ensue if a public inquiry was held. At Monday's protest, Shadow Home Secretary Diane Abbott said: "Labour fully supports the demand for justice for the striking miners at Orgreave and their families. "The truth must be told, but the Tories are refusing to hold a proper inquiry."